Just as I have done for the last ten years, I have been pushing the calendar since January, trying to move winter out of the way. I have pushed the hands of the clock forward each afternoon and held them back each morning, and gradually seen the day lengths creep longer and longer as the weather has warmed. It is June now, and if only I could stop the calendar I would be delighted. Our late spring daylight lasts almost 16 hours, a span that was unimaginable just six months ago. Winter's air can smell crisp and fresh at best, and a winter evening can be splendid in its silence, but today the air is alive. The scents of a billion blossoms waft through the air, and our songbirds have returned to fill it with their songs. Life is good; I no longer find myself scanning the lead- gray winter sky at sunset, wondering of the stealthy ice- demon will visit upon my airplane as it flies through the gloomy night. Airframe icing is predictable in that any flight through clouds at typical winter temperatures will cause ice to form on the plane. Some clouds are almost dry, some are quite juicy, and often there is an altitude that will be above, below, or in between the cloud layers. A thousand feet or a few miles can be the difference between severe ice and a "free pass", but you never know what awaits you. Whether to climb, descend, or change course is usually no more than an informed guess, which is why it is called "fishing". Ice, especially at night when clouds cannot be seen, is stealthy. Thunderstorms, especially at night, are not stealthy. You can see where they are and where they aren't, and the airplane's radar can usually pick out trouble spots farther ahead Sometimes the storms sweep along in lines, usually driven by a cold front, or sometimes they will be triggered by localized heating of warm humid air and float along as cells, clusters, or short lines. Last week we had examples of all these different storms. Much to my delight, I missed all of them, partially out of luck, but mostly because the locally generated storms start to die off as the sun drops towards the horizon. Without the sun's heat, the temperatures of the earth start to even out, and the strong updrafts that seed these storms diminish. Additionally, thunderstorms which are caused by colliding air masses, such as fronts, are always weaker and less volatile when the heat of the sun is not a factor. Volatility, or the propensity for thunderstorms to form abruptly, is the scariest part of thunderstorm flying. Last Friday I watched the Weather Channel radar as the entire Tug Hill Plateau area lit up with thunderstorms well ahead of a line that was still well to the west. The whole area went from zero to red in twenty minutes; a pilot leaving Syracuse for the north country could have been very rudely surprised. One morning last year I watched the airplane's radar as my clear path around a cluster rapidly become a box canyon as storms developed on the outside flank and far ahead as well. There was no gracious way to avoid the weather, and I had to parallel the path upwind of the storms for quite a ways before I could get past safely. The airplane's radar is more than a tool, it is a machine; its operation and interpretation must be learned and practiced. Sometimes it exaggerates the extent of the problem, sometimes it understates the problem, and sometimes it can actually lead you into the worst part of a storm. In any case, it only shows a narrow pie slice of the sky directly ahead of the plane, and once the rain really starts, our smaller radar units become useless. Properly used, it helps the pilot guess. My choice between summer weather and winter weather? No doubt it is the same as yours. Thunderstorms might inconvenience us for a few hours or maybe not at all. Winter weather is a full time problem, from frozen plumbing, to balky cars, stinging wind, slippery roads, bottomless mud... and old bones that are no longer invigorated by the challenge. Last week I was leisurely spreading a pile of driveway gravel. The still air was hazy, hot, and humid... but as I am now inclined to say, "at least it wasn't snowing". The air was filled with the fragrances of several flowering bushes, and the Oriole's song floated over the sparse midday conversations of the woodland birds. I thought of the last few weeks, getting on hands and knees to smell the first dandelions and daffodils, and later embracing the apple trees and lilacs. I delighted in the first robin's song, and waited patiently to hear the first arrivals of tohees, catbirds, and wood thrushes. Time has marched its grand circle and brought us back to this wonderful place, but unfortunately it will continue its trek. For now though, like an old gray woodchuck, I am happy to look around, feel the sun, smell the breezes and say "I've made it through another winter!" This picture doesn't really relate to the glory of springtime, but it shows what I was looking at as I skirted the storms that I mentioned. 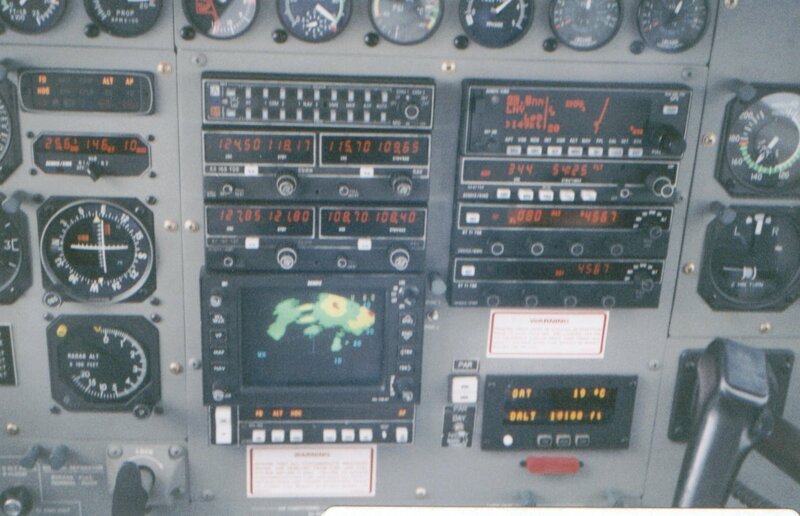 The picture is of the radio stack which is located in the center of the airplane's instrument panel. The left stack, from top down is the audio switching panel, the number 1 comm/ nav radio, the number 2 comm/ nav, and the radar display. The right stack is the GPS receiver, the ADF, the number 1 transponder, and the number 2 transponder. Looking at the radar display, the left- most thunderstorm cell (the red area) is right about where the diagonal line... my original course... would have taken me. I have already turned left to avoid it, but the yellow areas have erupted ahead of me on the new heading. Soon after this picture, I turned further left and watched the yellow areas fill with red centers. I flew west for thirty miles before turning north to regain my original northwest course.